Celebrate children’s reading by making them a Reading Star. Encourage and reward their reading success with reading incentives. 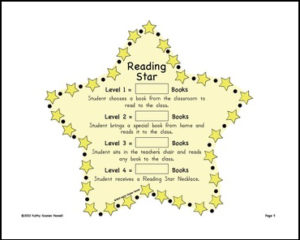 Each Reading Star has 4 Reading Star levels. You can choose a star that has minutes, pages, or books on it. Personalize it to fit your classroom needs. Copy the star on heavier paper, cut out, and laminated. You can then hang it in your classroom. Next, choose how you would like to have your students log in their reading. There are 3 ways: using minutes, pages, or books. Color stars are provided for all 3 ways with blank lines to fill in the numbers that best fit your grade level. There is a Reading Star Log to record reading that is completed with classroom books, library books, or books read at home. This Log can be used in the classroom and also sent home for logging in homework reading. Printable Reading Star necklaces are included.